Often when people are unhappy, they start trying to change their circumstances, or they lament how they can't change their circumstances so they are destined to stay unhappy. The truth is, there are some things that we can't change or can't change easily. We can't easily change our annual income, where we live, our health circumstances, or our upbringing. We can't change our age, race, or gender. So how do these factors really influence our happiness? What can we change to increase our happiness? Read on for more information about what you can control, what you can't control and what doesn't really matter. poor. As long as you earn enough to feel secure, your level of happiness is not tied to your money. Now, when you look at what your neighbors have or your Facebook friends, then you may feel like more money will mean more fun things, but this isn't about money, it's about your perception of what you feel you are missing out on. Consider this, in the US, France and Japan, purchasing power is higher than it has ever been, but life satisfaction is the same or lower and suicide is on the rise. Powerball winners report levels of happiness skyrocketing at the time of the win, but return to previous levels of happiness within a few months. If you value money over the achievement of other goals, then you tend to be less satisfied with your life as a whole. Think about being trapped in a job you hate, but the money is good. Those people are usually pretty miserable. It's not called the golden handcuffs for nothing. Warren Buffet, Oprah, Richard Branson, they do what they love to do. I am sure they love the money too, but it's the thrill of accomplishment, or having a purpose or passion, that really drives them. So live to work, and if that doesn't work for you, work to live - meaning your job needs to allow you the time to do the things that do bring you enjoyment. Take a trip the park with a loved one. Free. Enjoyable. Age: If you are worried about your age, here is something to look forward to, life satisfaction tends to increase with age and emotional roller coasters tend to even out. Health: Your perception of how healthy you are has more of an effect than your actual illness, unless your illness is severe and long lasting, then it can certainly bring you down. Most people will adjust to their new "normal" and likewise will return to pre-happiness levels. This has occurred even in those who have lost limbs or have become paralyzed. Age, Climate, Race and Gender: very slight effect for age, none for climate, none for race (although rates of depression tend to be greater in caucasians). For gender, women tend to have higher highs and lower lows, but it averages out to about the same. 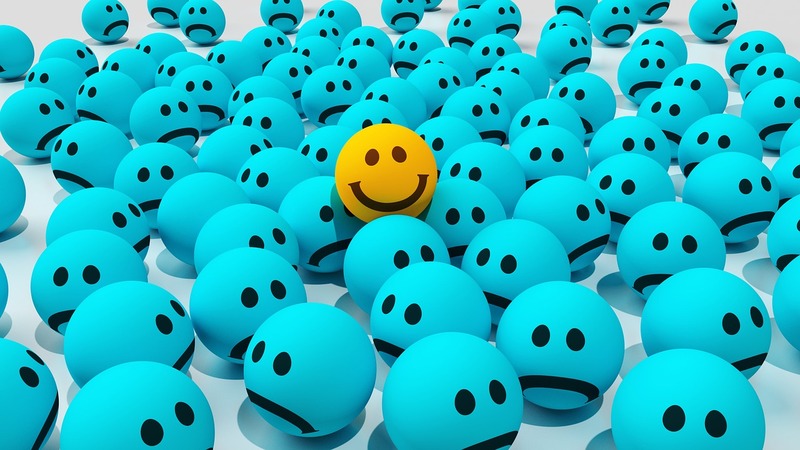 Negative Events: Happy people have as many bad times as unhappy people. Religion: People with strong religious beliefs tend to be happier and weather down times better. Researchers think it is because religion instills in one a hope for the future, and creates meaning in life. Social Life: Very happy people tend to have a rich social life for some that is quality and for some quantity. The bottom line is those that feel alone are unhappier than those that feel connected to a few close friends or a group of friends. Now, the question is do happier people tend to attract more friends or are they happier because of their social life? No one can say for sure yet, so to be on the safe side, schedule a coffee or lunch date with a friend today whether you feel happy or not. Marriage: Marriage is robustly related to happiness. Married people report being happier, unless you are in a bad relationship, then this tanks your happiness probably more than any other factor mentioned. If you are in a toxic relationship, it is killing your happiness and that probably goes for friendships as well as romantic relationships. And if you are the toxic friend or partner, maybe make a plan to be less so. ( Are You the Toxic Friend? Five Ways to Change It.). It will increase your happiness. Internal factors are how you think of your past, present and future and they all influence your happiness. In other words, you have the most impact on your own happiness. I have some articles planned for increasing happiness in the present and future coming up, but I want to talk about the past a little bit. Past: How you think and interpret your past influences the emotion that follows in the future. So if you didn't have the greatest childhood, how you interpret those events affects you today because you have an emotional reaction to it now. If you dwell, rant and rave, and wish that things were different, then that actually leads to more "bad" feelings (and literally heart disease, btw). In fact childhood events (barring anything super traumatic, or long lasting) actually have little affect on your adult personality. Your past does not determine your future. I have to say, as a parent, this is a huge relief. Missing their dance recital occasionally, getting a divorce, these things will not screw up your kids, unless they are ruminators, then still it's their ruminating, not the event itself that causes the unhappiness. If this is your kid, check out this article with tips on how you can change this. (It's probably good for your too.) WHAT IF YOU COULD ENSURE YOUR CHILD'S SUCCESS IN LIFE? Two ways to deal with the past are to appreciate what went right. Savor and appreciate the good events more, instead of lamenting over the things that weren't good. Secondly, practice forgiveness. Forgiveness is a hard thing, and a post of its own, which I definitely will write soon. Often, we don't want to forgive because we still feel that what the person did was unforgivable and forgiving them is letting them off the hook and saying it's okay. Not true. What they did may never be okay. You don't forgive for them. You forgive for you. Love yourself enough to allow yourself to move on. You can't live in the present, let alone move into the future while you are holding onto a grudge in the past. How are you really hurting the person you are choosing not to forgive? Chances are, you aren't. They may wish things were different, they may not even know you hate them, but I'll bet they are moving on with their life while you are stuck in the past. I'll research some of the paths to forgiveness and write about it soon, in the meantime, start getting mentally warmed up to the idea. Quite blaming outside factors for your current mental state. Stop worrying about what you can't control and start thinking about what you can control. Indulge in a daydream in which in the distant future you are happy. What is making you happy? Make a date with a friend for coffee, lunch, or a cocktail this week (my calendar is currently wide open). Spend less time with toxic friends and/or work on being less toxic. Consider what a current bad relationship is costing you. Start thinking about what holding onto a grudge is costing you.